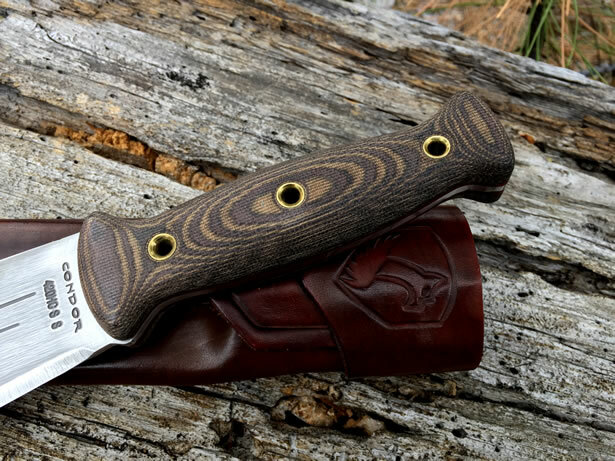 The Primitive Bush Knife (CTK242-8) features with 420 HC (High Carbon) stainless steel, the blasted satin finish is achieved by sand or bead blasting the exposed metal portion of the blade. 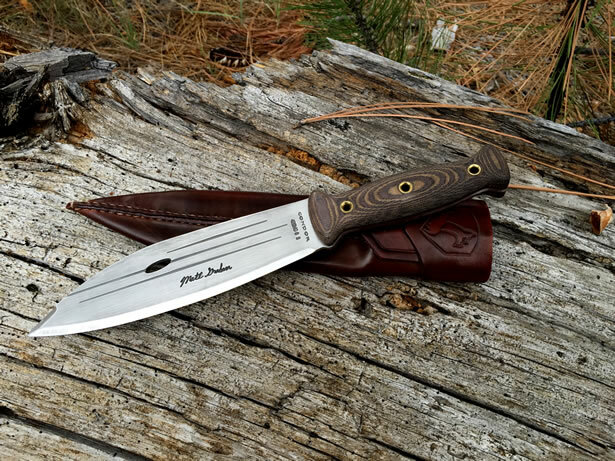 The blade is full tang skeletonized, 8″ blade length. 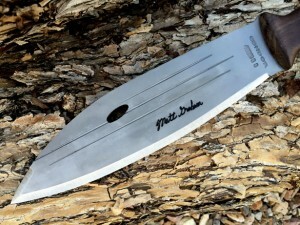 Condor type blade and stamped with the signature of its designer (Matt Graham). Every edge is hand finished and polished to sharpness for Salvadoran people. Matt’s blade resembles that of a short barong to me, which is basically a leaf shaped bolo, commonly found in the Southern Philippines. The shape of this blade is definitely one of my favorite machete profiles. 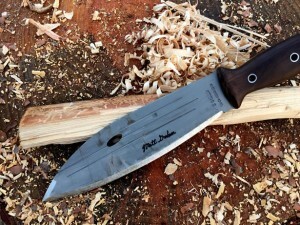 Soon after seeing the videos of Matt with his knife I ran across an ad for the Primitive Bush Knife (PBK) from Condor Tool and Knife. I knew then that I had to get my hands on one for a demo. I’ve seen a lot of talk around the net about the origin of Matt’s blade. Some think that the original blade is a heavily modified Condor Jungle Bowie – the one with the blue handle, but it all seems to be speculation at this point. With a reshaped blade and wrapped handle, I can definitely see some similarity there, but I’d sure love to hear Matt tell the story about how it came into being. It took a while before I was finally able get one of these blades for a review. I was pretty damn excited when I learned that it had finally shipped. Once it arrived and I actually had a chance to hold it in my hand and mess around with it for a while, I was a little disappointed. I suppose that was mostly due to the high expectation that I had set for it in my mind. I found the balance to be very blade-heavy, and while the handle is a good quality hardwood much like the Bushlore handles, it was a far too narrow to wield comfortably. Additionally, there is absolutely no way that anyone could spin this blade like a hand drill without modifying the scales in some way. It was a bit of a letdown really, this could not be what Matt had in mind when he originally designed it. However, I knew that I still had to review this knife with the stock handle so I decided that I need get myself another and solve the problem that I had with the handle design. I knew just the guy who could help me get it done right, so I reached out to my good friend Joe @ LMF Knives and asked him for his help once again. I needed Joe to perform some kind of miracle, and he was definitely up for the challenge. I filled him in on what I was trying to accomplish, and a few days later he sent over a couple of pictures to show me how it was coming along. I was completely amazed. Once I decided on which pins to use, it took a few more days for him to finish them off. 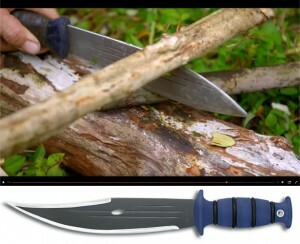 The Primitive Bush Knife has an overall length of 13.5″ and a blade profile that resembles that of a compact barong. It features a broad leaf-shaped fore-blade pattern consisting of a long sweeping belly that extends 8″ from the tip to the finger guard with a modified Scandi-ground edge, and a long sweeping 90° drop-point spine. The point at which the two sides meet is fairly offset with a 1.125″-long semi-sharpened swedge on the spine. I say semi-sharpened because some PBKs are sharpened and some are not. I don’t think it is supposed to be sharpened, so I guess it really depends on who happens to be at the grinder that day. The blade has a skeletonized full-tang design made from 3mm thick 420HC, which is a high carbon stainless steel roughly comparable to 440A. It has been treated to a Rockwell hardness of somewhere between 56 and 58 for its high durability and edge retention properties. 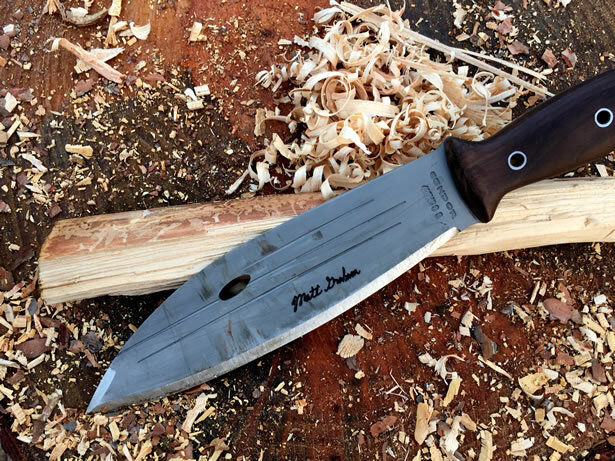 Each PBK is finished and sharpened by hand in El Salvador. It has a bead-blasted satin finish, three decorative grooves and the ever so distinct Eye of the Condor stamped through the side of the blade. In addition to the common Condor and El Salvador stamps on either side of the CTK blades, this one also has Matt’s signature etched into it on one side. The stock handle of the Primitive Bush Knife is listed on the website as a hardwood, though I am fairly certain it is walnut to be specific. 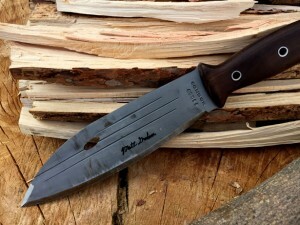 Either way, it has a very attractive wood handle firmly held in place with epoxy and three aluminum lanyard tubes that can be used for lashing the knife, or with a lanyard to improve knife retention. The wood handle is approximately 1.31″ wide across the belly of the handle, closely following the contour of the tang, and approximately 0.69″ at its thickest point. The custom canvas micarta scales that Joe @ LMF Knives had fabricated for me were designed not just to replace the stock wood handles for aesthetic reasons, but to improve the overall functionality of the blade and enhance its ergonomics. But the new scales were not cheap, costing me a little over $75 when you count all of the shipping involved. I figured if I was going to make that significant of a change, it might as well look good too. As a result, I chose the brown and tan canvas micarta with a bead-blasted finish to give the blade a weathered woodgrain look, and stay with the overall theme of the blade. However, I did opt for three brass lanyard tubes and a pair of dark red G10 liners to add a little character. Joe was able to greatly enhance the ergonomics of the handle by following the contour of the large handle belly, and adding a proportionally rounded palm swell nearly 0.31″ thicker than before in addition to flaring the front and rear quillons to further exaggerate the contours of the handle. This not only improved upon the overall comfort of the grip and grip retention, but also reduced any user fatigue experienced from wielding the blade while performing laborious tasks. Additionally, the newly contoured scales finally had enough volume in all the right places to allow the handle to spin while rolling it between my palms like a hand drill – exactly what the doctor ordered. The increased handle volume also added 3.1 ounces to the weight of the rear-end of the blade, shifting the center of balance all the way back to the finger guard, which in my opinion greatly improved the control and increased the striking force of the blade. 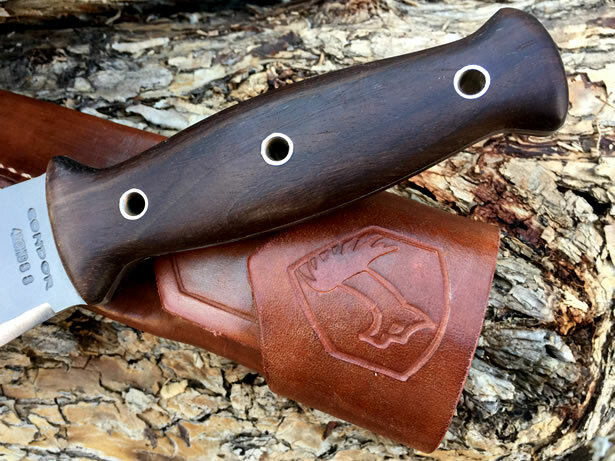 The Primitive Bush Knife comes with a beautiful Scandinavian inspired high-quality brown leather sheath with the Condor and Shield logo embossed on the front. 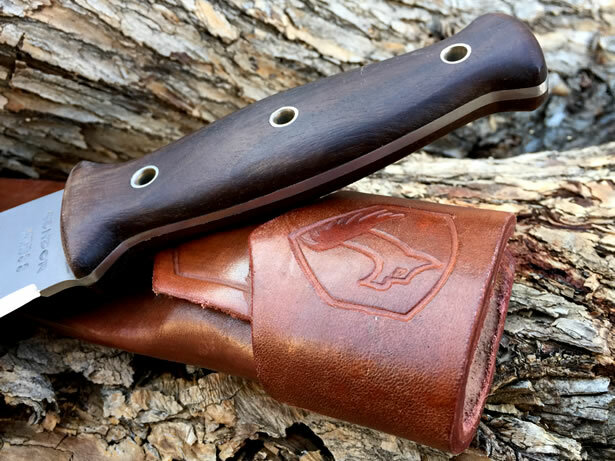 This sheath is unique in that it has no belt loops or lashing points. It is designed to be tucked behind a belt or sash down to the leather tab that keeps it from falling through. The advantage to this is that the sheath is easy to move or remove completely without having to deal with a belt or other attachment mechanism. 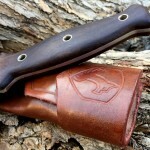 The sheath is formed to the shape of the blade and holds the blade firmly in place. 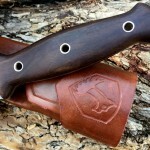 There have been some reports of loose-fitting sheaths – and some very tight. However, a simple wet form can cure either of those ills without much effort. Now let’s see how Condor’s Primitive Bush Knife performs… In order to provide some sort of apples-to-apples comparison between blades, I will be performing five durability tests: Chopping, Batoning, Fine Blade Control, Tip Strength and Edge Retention. In a survival situation, all resources are fair game. However, since was not in a life-or-death situation, I stuck to some seasoned wood that I had lying around for these tests. For parts of this test, I decided to mix it up a little by using both Bush Knives for this demonstration so I would have the opportunity to evaluate both handle variations side by side. This was one of two tests where the handle would make any substantial difference, but it would be the only test that I performed with both knives. In order to prepare some logs for this test, I had to strip the foliage, twigs and small branches from a 5″ log that I had to work with. I began delimbing the main branch with the stock PBK first. Right off the bat I realized how well the blade was designed for chopping small material. Most of the growth only took a swing or two to chop off. However, whenever I choked back on the handle using a two or three -finger grip to gain more leverage, the handle began to slip out of my hand forcing me to readjust my grip. I tried using the customized PBK on the same material. Again, it chopped the small material off almost effortlessly, but as I chopped, it was pretty obvious how much better the customized PBK was performing. The additional 3.1 ounces behind each swing was definitely noticeable, and the grip on the handle was much more secure and less fatiguing, especially while I was using a two-finger grip off the end of the handle. Next, I started chopping a section the 5″ branch off with the stock PBK. The goal was to get some material ready for splitting with the PBK and a baton for the next test. For this, I would need a few logs about 12″ long with a flat surface on at least one end. 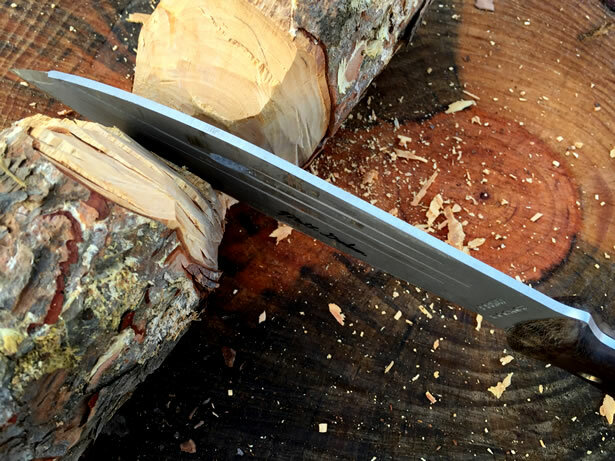 Chopping a 5″ branch with an 11.1 ounce knife is tedious to say the least. But with the large belly and Scandi-ground edge, the PBK bites deeply into the material without having to exert too much force. The blade did most of the work, though I recommend wearing gloves to absorb some of the shock. It took at least five minutes to get all the way through the log, but it did make it through. To wrap up this functional test, I performed the same task with the custom PBK as well. I used the same branch, just about 12″ up from the last cut. The edge of the blade performed identically to the stock PBK. However, the additional 3.1 ounces found in the custom micarta scales and the improved shape allowed me to strike the branch with much more force so I was able to make it through the material almost a full minute faster. To test using the Bush Knife with a baton, I split both of the 5″ logs that I had just chopped in the earlier test using a 3″ diameter baton about 18″ long. First I halved the first log, and then worked my way around each half until the pieces were no larger than 1″ in diameter. The long-sweeping curve of the spine and drop point made no difference to the baton whatsoever, however I do recommend you keep from hitting the swedge with the baton as it tends to dig in deeply and will quickly shred the baton. Rather than trying to split material that is way too large for this blade, I opted to cross-cut some material around 2-3″ in diameter using the baton method for the second part of this test. Like chopping, the large belly, 3mm blade and Scandi-ground edge bit deeply with each strike of the baton making quick work of the material. Each cut was clean, and within a few short minutes all of the material was processed down. To test the PBK with some fine blade control, I made a few tent pegs and a simple split-stick deadfall trap trigger. I grabbed a few small branches about 3/4″ in diameter that I had lopped off the main branch earlier and chopped them all down to about 10″ in length. Then I cut a notch in each about 1/4″ deep and approximately 1″ from the top of the peg. 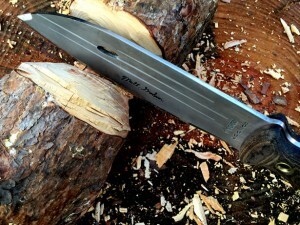 To do this, I placed my cut across the grain first, then I used my thumb to guide the blade as I cut in the notch. The last thing to do to finish the pegs off was to cut in the point on the other end which was easy work for the Scandi-ground edge. Next I tried my hand at making a simple trap trigger. I started off with a 1/2″ stick about 12″ long as my support stick, and a 6″ stick about 3/8″ in diameter for the bait stick. I shaved a small mark along one side of the stick to make it easy to figure out how they fit back together, then I cut it in half before notching a groove where they fit together to hold the bait stick. Finally, I made the bait stick pointed at one end to hold the bait – and tapered at the other end so it fits snuggly into the notched hole between the two halves of the support stick. For this part of the test, the goal was to make a pile of thinly curled shavings (aka feathers) large enough to start a fire from a stick about an inch in diameter and a little shy of 12″ long. I began shaving curls from about halfway up the stick, taking each all the way to the end, all the while trying not to dig in too deeply or apply too much pressure so the curls would be as long and thin as possible. It is also important to note that the rear half of the belly seemed to be the sweet-spot for feathering, as well as most of the other finer work performed with the PBK. As I worked my way around the stick, it was easy to see just how effective the sharpened Scandi-ground edge was at feathering once you find the correct angle and pressure to apply. Once you determine that, you can make a pile of thinly cut wood shavings grow rather quickly. Before long I had a couple handfuls, more than enough to get a fire going. 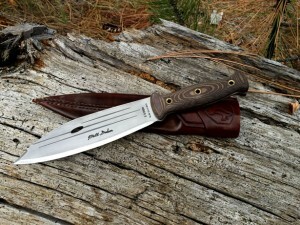 To test the Primitive Bush Knife at stabbing and piercing without the bending or breaking the tip, I drove the tip end of the blade into the end of a 12″ stump as hard as I could. Then I loosened the blade using a side-to-side motion until it was loose enough to pull out. I repeated this action a few more times for good measure without any sign of damage to the blade, tip or sharpened edges. 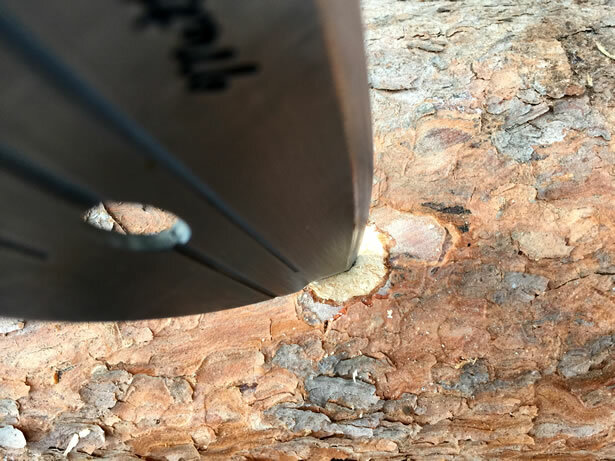 To bore a hole in the side of a small log, I used the custom PBK so I could test its ability to be used like a hand drill, something not possible with the stock PBK without wrapping the handle in some way to increase its thickness and girth. As I began spinning the blade at a semi-rapid pace, the tip bored cleanly through the material. The more pressure I applied and faster I spun, the faster it cut into the material. The slower I spun and lighter I pressed, the more control I had over the tip. After a few minutes, I had a cone-shaped hole about 1″ deep and 1″ in diameter. I have never used a blade in this way before, and I must say that I was thoroughly impressed. After all of the other functional tests were completed, both PBKs easily sliced through single sheets of paper without issue. There was no sign of cracks, chips or imperfections of any kind, with the exception of some slight wear on the blades’ finish. Both PBKs held their edge and remained sharp through the entire process, even with all of the punishment that I threw at them. 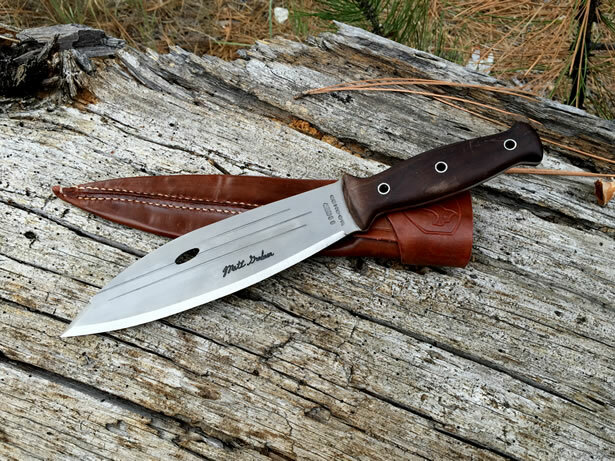 The Condor Primitive Bush Knife features a wider fore-blade coupled with a long sweeping belly adding to the centrifugal force behind each swing for better chopping and slashing power. This makes it perfect for processing vines and woody vegetation, though, the PBK is not really designed for chopping hardwoods or material that is very large. If it was all you had, it would likely get you by just fine. Working with softer material, on the other hand, is where the PBK really shines. As a fan of Matt Graham, and barongs in general, I had really high expectations for the PBK, though I must admit that they may have been too high. After all, the blade is made from a high-quality 420HC stainless steel, the handle from a beautiful walnut. It did perform well at every task that I put it through, right? Unfortunately, I just could not get past the poor ergonomics of the thin handle scales so I had to have them customized. 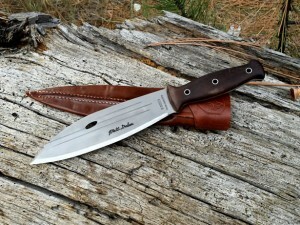 The customized PBK has become one of my favorite blades, and I would encourage anyone interested in the PBK to try one for themselves if they like the blade pattern and sheath design, knowing that if they didn’t like the handle, it can easily be customized in a number of ways from simply wrapping it to having the scales replaced entirely by a professional. The new micarta scales are not only beautiful, they are extremely comfortable to wield and enhance the performance of the PBK a great deal. 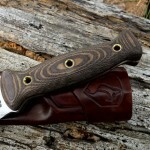 I’ve always known that a good pair of custom scales could improve upon a blade’s performance. I just didn’t realize they would improve the performance of the PBK so much. I think they were worth every penny that I spent on them. Now to send in my other PBK for its new wardrobe. 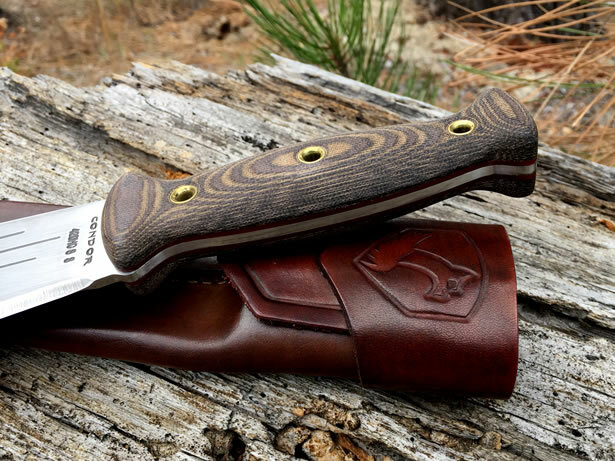 UPDATE: I just heard some great news from my contact at Condor Tool & Knife regarding the release of a new model of the Primitive Bush Knife with brown micarta scales as part of their 2016 lineup. Exciting news, and a welcome addition to say the least. 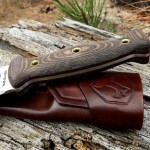 Condor Tool & Knife offers a unique line of high quality, superbly designed tools for the outdoor enthusiast. Condor’s line of fine machetes, axes, knives and survival tools are made in Santa Ana, El Salvador to the highest technical specifications and will last a lifetime.